A clear example of TCX’s impact can be found in Myanmar, where an agreement between TCX and the Livelihoods and Food Security Multi-Donor Trust Fund (LIFT) has boosted access to much-needed capital in Myanmar’s microfinance sector. Myanmar’s microfinance providers needed to access significantly more funds in order to expand and satisfy the microfinance needs of the population. However, the volatility of the Myanmar kyat (MMK) and the regulatory interest rate ceiling (13% p.a.) made lending in local currency unattractive to foreign investors. TCX and LIFT established a unique cooperation that opened up the microfinance sector for larger scale foreign investments. 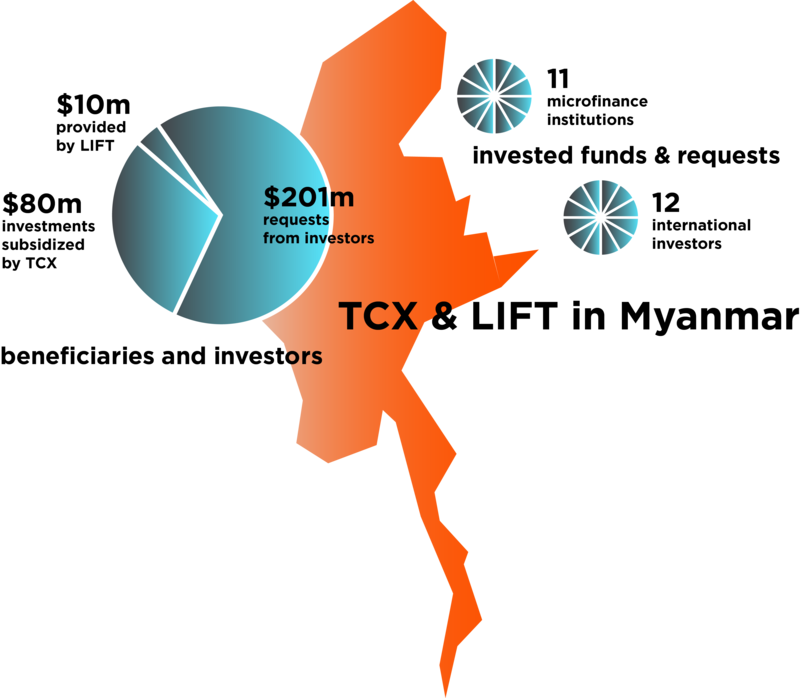 TCX provided a hedging service which enabled investors to lend in local currency to Myanmar’s microfinance sector, while at the same time protecting them from any MMK exchange rate volatility. However, the resulting interest rate in kyat, to be paid by the microfinance providers, would be above 13%. This was a problem, as the Central Bank of Myanmar imposed an interest rate ceiling of 13% on commercial lending and, unfortunately, 13% was not enough to compensate for the risks involved in lending in kyat to microfinance institutions. As a result, foreign lending to microfinance providers in Myanmar was heavily constrained. This is where LIFT entered the picture. LIFT made funds available to subsidize the interest rate levels of these local currency loans, bringing them down to 13%, i.e. the level of the Central Bank interest rate cap. The result is that lending in kyat all of a sudden became attractive to foreign investors. The facility was, and is, a huge success, as witnessed by the surge in appetite of impact lenders for microfinance institutions in Myanmar: the facility was launched on December 1st, 2016, and was vastly oversubscribed within a few minutes, with eventually over USD 200 million in requests.